I have been not keeping up with my journal entries very well. I feel I need to supply a brief summary of what has been happening. As you know, last Saturday I fell and injured myself trying to break up a flock of turkeys. I hurt my upper right arm and shoulder; my right hip; my left foot and ankle and, the worse, are the aches and pinches around my left knee. I am mostly pain free with the exception of my hip and knee. Last Sunday, I did play with three bands at the Armstrong County League of Arts at www.leagueofarts.org and later attended a Bible study. Monday morning , despite the aggravations, I managed to be in the rainy and breezy turkey woods early. I was watching Hurricane Sandy. The weather was predicted to produce heavier rain and higher winds, so I decided to ignore the pain and try to hunt some prior to the weather changes. I did see a lot of squirrels and deer, including some bucks, but the pains were intensifying and I became rather soaked. I decided to leave before noon. I was walking a gas line when I noticed a deer leg to my right in the crabapples. Shortly, I saw a glint of “horn”. I eased up and could see a 4-point buck. I watched him at 15 yards before he decided to lay down and chew his cud. Eventually, the winds changed and he smelled me prior to his escape. A doe on the gas line ran too. Tuesday afternoon found me at State Game Lands 247 near Center Hill, Pennsylvania. I saw some deer and one buck here too as I walked for about two hours before aborting the mission. On all of these excursions I have been seeing plenty of robins and other birdlife. 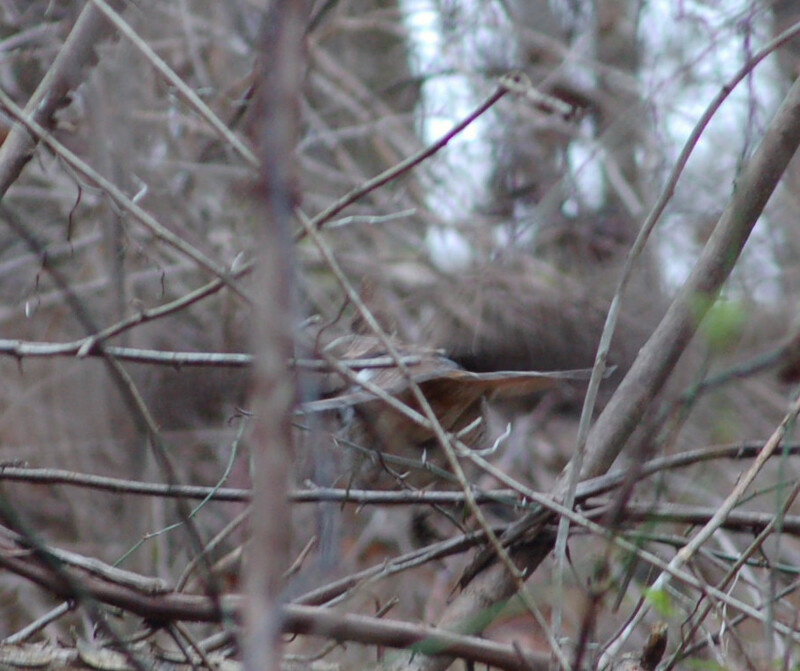 I have, also, seen cedar waxwings and the first juncos of the season too. On Friday, Bob and I headed to Everett, Pennsylvania (Bedford County) to pick up the butchered red stags. I saw an all white hawk flying and landing in a tree while we were in transit. Lots of turkey vultures near Bedford. Today, Bob and I entered the turkey woods. I set up to listen and call in the pre-dawn hours. As I walked along a ridge calling I heard a turkey across a big hollow. I set up hoping to call the turkey in….nothing! I went in the direction and later found smokin’ scratchings! Why I didn’t call at this point is a mystery to me.I guess I was hoping to walk in on the turks causing a breakup making for a good hunt for Bob. Ten minutes later, while walking, I saw several birds along the hill’s edge above me. I knew I had no chance to charge uphill. My asthma will not allow such exertion. I pretended I didn’t see the birds and circled coming, eventually to the top of the hill above where I had seen them. I could not locate the birds! I tamped all around even backtracking to where the scratchings were. 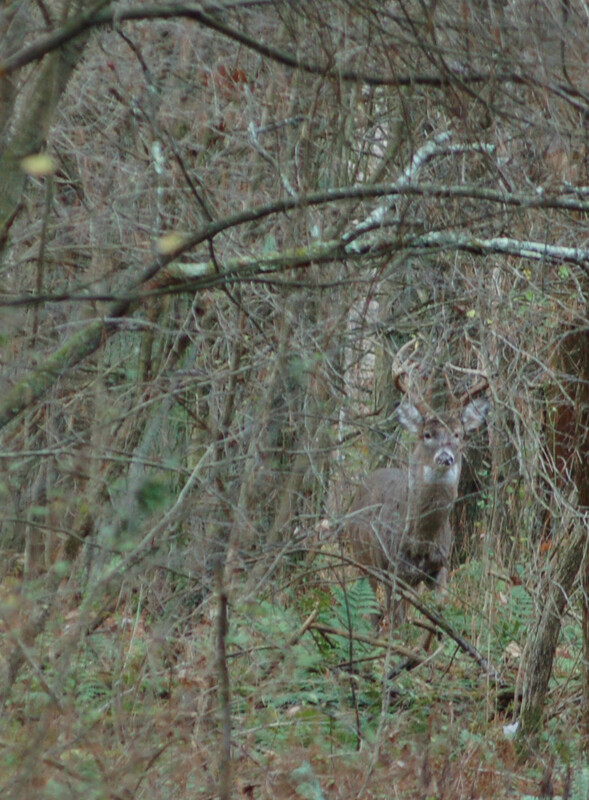 I did see bucks including a fairly nice-racked buck. While walking I noticed a grouse setting on a limb among some vines. Just as I was focusing the bird flew. I did get an interesting photo as the grouse took flight. I decided to work towards a round top. I walked into two gobblers. The big birds took flight, but no break was offered. By noon the aches were becoming difficult in my knee and back so I elected to go home and rest some. Laurie and I were to go a friend’s birthday party, however, she hasn’t been feeling very well for the last several days. So Happy Birthday Brad! Monday will find me out again, at least for a while!